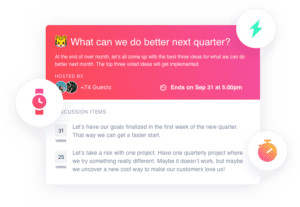 Building off SoapBox’s free one-on-one and team meeting agenda feature (Teams), Discussions allows managers to launch specific, organized and actionable in-app discussions to collect input, ideas, feedback or questions with anyone at their company. SoapBox has been helping leaders listen to their employees for 7 years. The manager-to-employee relationship is the single most important variable impacting employees’ success and motivation. So, Discussions was designed with the manager in mind. Unlike getting input through chat or email, SoapBox helps managers organize input by allowing them to define the topic and timeline. Ideas and feedback are then prioritized with votes and comments and, once the Discussion ends, managers can close the loop on how they plan to action the input. When employees are empowered to collaborate on decisions that impact their work, they take ownership over the results. Not only do managers benefit from better decisions and a more motivated team, but they show employees that their voices matter. Learn more about using SoapBox Discussions to collect employee ideas and feedback. 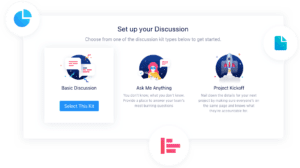 Sign-up for your own SoapBox to get started with the free Teams feature and email jillian@soapboxhq.com to activate the Discussions feature.